The effeff 934 is a mortice electric strike designed to be mounted horizontally in the frame above a frameless 90° swinging door. There are models designed for 10 mm, 12 mm and 15 mm glass. This strike scores well from an aesthetic point of view, as all that can be seen is a small stainless steel catch. 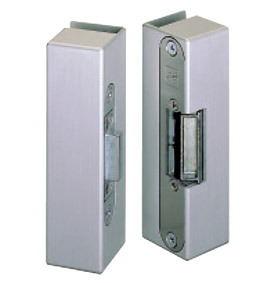 The effeff 9334 is a surface mounted electric strike that consists of a strike and a corresponding bolt. 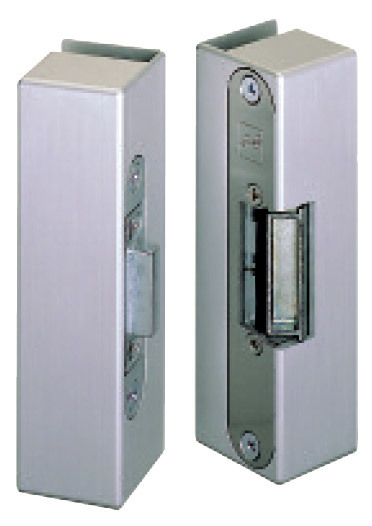 This is the ideal secure solution for 90 degree swinging doors of any door height as it is designed to be mounted directly next to the handle at the mid-point of the door. Klik op bovenstaande afbeeldingen om ze te vergroten!